You are here: Home » Magento extensions » How Online Store Owners Can Improve Customer Relationship With Magento Extensions? How Online Store Owners Can Improve Customer Relationship With Magento Extensions? The success or failure of any eCommerce website is depended on various aspects and consistent communication or interaction with the potential clients or customers is one of the most important aspects. Do you think you are losing your potential customers just because of poor interaction or communication with the customers? Do you think you are failing to create a strong impression in your customer’s mind? If the answers are affirmative, then it is time for you to revamp your Magento eCommerce website with the help of extensions like order follow up email Magento extension. Caring attitude towards your potential customers is the only thing that can help you survive in today’s dire economic days. Today, online customers love to get pampered and if you fail to help them solve their issues or queries within a stipulated time period, then they will be impressed with your responsiveness and buy products from your online store on the go. How Magento extensions help store owners to be more responsive??? Being an online store owner, you may have used plenty of Magento extensions to boost up the performance of your Magento web development venture, but have you ever thought of improving your communication with the customers by responding their emails or queries on the go? If yes, then it is time for you to make a move and choose a few of the most impressive extensions that can help you act smartly and respond quickly to your customers. 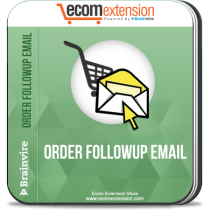 There are a few Magento extensions like order follow up email and more, which can help you auto-respond your emails while helping customers get their problems solved dynamically and quickly. Such extensions will act as a customer relationship tool that empower store owners to schedule their email response after a specific hour of time, which eliminates the need being present all the time to respond the emails sent by the customers or shoppers. • One of the very first benefits that online store owners can leverage from such extensions is that it helps you improve the conversion rate of your eCommerce website. By effectively managing the emails to the buyers, you can smoothly encourage them to come to your eCommerce website. • More powerful and effective tracking abilities help you leverage from better customer insights, which at the end enhances the overall sales. • Make it easy for the online store owners to analyze the effectiveness of their follow-ups with the help of Google analytics. • Supports for newsletters and transactional email templates improves the overall interaction with the customers. Apart from all these, there are a lot of other benefits that store owners can leverage from such Magento extensions. Do you wish to improve customer relationship or satisfaction through better responsiveness? If yes, then contact us now to get your own personalized Magento extension on the go…! Drop Shipping – Why It is the Future of Ecommerce! 5 Reasons to Embrace AI to Improve B2B E-commerce! How can E-commerce Businesses Flourish with Facebook Messenger Bot? How Magento Extensions Can Help You & Your Potential Customers? Magento Theme Development – Free Or Custom, Which One Is More Preferred? © 2019 Brainvire.com. All Rights Reserved.